Need new prescription glasses? Live in New York state? Starting tomorrow, Thursday, Dec. 9, 2010, CoastalContacts.com is giving away 10,000 free pairs of glasses and frames to folks who live in New York. The freebie starts at 9 a.m. EST so be ready because the free pairs will go quickly. Start today by clicking on the above link and "liking" CoastalContacts on Facebook. Then click on the "get the code" tab and go to their site and pick out the pair you want. It's smart to do this before the giveaway starts because the site will slow down from overuse tomorrow. At 9 a.m. EST, go back to CoastcalContacts, plug in your coupon code, and get your free glasses. The frames and lenses are free, but you pay for shipping, handling, and any upgrades, like anti-glare coating and scratch resistant lenses (together this costs $15). If you want lightweight lenses, tints, or progressive lenses, there is an upgrade fee. If you've never bought glasses online, CoastalContacts makes it easy. I know, I got a free pair of glasses during their previous promotion. 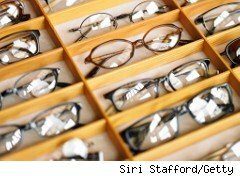 If you're tied to buying glasses in person, Consumer Reports recently put out a list of the best and worst places to buy glasses. Caveats: Some frames are not eligible for the freebie and will be marked as such. One free pair per household. If you got a free pair during an earlier promotion, you are not eligible for this promotion.